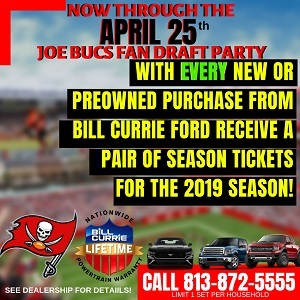 Joe’s got the audio downloads below of a very interesting interview of Tampa Tribune Bucs beat writer Woody Cummings with Justin “The Commish” Pawlowski on 98.7 FM yesterday. Joe already brought you Cummings’ take on the Bucs starting multiple rookie cornerbacks next season, but this is the entire back and forth. Among the takes, Cummings says the Bucs weren’t happy to see Michael Bennett leave their nest. Check it out below. It’s excellent lunchtime listening. The Rock Star should be FIRED!!!!!!!!!!!!!!!!!!!!!!!!!!!!! C’est la vie, sometimes you play with fire and get burnt. Time to make the most of whats left now. Willing to overpay every every free agent we sign from a different team…unwilling to pay a fair price for guys that we brought up in this system…Senseless. To be fair, does this sound like Dominik or is there some Schiano influence going on here? What do I know? I didn’t like it when they let Cadillac walk and Schiano was nowhere around. Aldon Smith, Von Miller, and etc left one on one all game, all season… your looking at them smashing the record books, so yes 9 sacks is nice on paper but for someone who wanted top dollar it just wasn’t all that impressive. .
Bennett sining with the Bucs would have been the equivalent of a counter offer. He made the right move. Dom SCREWED up. If the man was worth a bit more than 5 mil they should have offered it beforehand. After the fact it’s like a slap in the face. Hate to see him go, but Dom and the Bucs asked for it. I truly believe they passed on him. whether that was the right or wrong decision, only time will tell. they have been right about letting other players go such as K2, Tanard, and even Barrett Ruud because they did not stick with other teams. Remember that guys? Barret Ruud? so many people where up in arms because they thought the bucs had make a mistake in letting Ruud go and it turns out it was the right decision. the Bennett situation is exactly like the Ruud situation. they are both solid players who wanted big contracts that the bucs said no to. so let this play out before you rush to judge. …Although, they’ve been looking for answers for years! Players do have a say in where they play. I’m sticking to my “tailor” and say Bennett made the decision and the Bucs had no say. This is deeper than outward appearance. Bennett may very well be back in August after Seattle cuts him for the second time. Yesturday the USA Today grades, they said the Hawks made super moves and now the 49ers better be scared. For the people bitc..ing about his sack. The QB’ only needed 2.5 seconds to get rid of the ball. Their receivers were wide open! What happened when they tried to run? Bowers was no better nor was anyone else. They were all left grabbing at shoe strings. Everyone is drooling over the Hawks and 9ers. Keep in mind, they both have 1st year QBs entering their 2nd season. And ALL the defenses around the league are planning against and watching tape of the read option. Both of those QBs will have slumps in their 2nd season as starters. Dial back the seattle/san fran slobber. This team will not rise or fall on the presence or absence of Bennett. For the right price it would ave been wise to resign him but it isn’t a great loss. @snook – agree completely about the Seahawks, Russell Wilson will fall back to earth big time next year. I think the 49ers will be salty though, tough to bet against a team/coach thats been to back to back NFC championship games and is so solid on both offensive and defensive lines. Bennett will fire his agent sometime in the next 365 day’s.1 year deal to go to a 4 man rotation.He’ll probably only see half the snap’s.We’ll see what he get’s next year coming off a 4 sack season. this is all on Bennett …what a moron. he could of had more money here and more playing time…dude is a little crazy, like his brother. What I want to know is these three questions. #1 Was Bennett aware of how much the Bucs top dollar offer would be before he hit free agency? #3 Or, were they actually waiting for Bennett to give them a bid to match? I think Bennett chose to move on to a perceived SB contender. woody is right, and this was a foolish move by Dom. Dom assumed that Bennett would give the team a chance to match or better the offer. However, Dom turned off the agent and player through negotiating. I bet schiano is not thrilled bc it appeared that he appreciated Bennett, and Bowers is a multi-faceted gamble. I see it more on Bennett than Dom. If Bennett would of came back with that deal to the Bucs I bet that they would of match or add more to it like 5.5 per year for 2 years. Bennett has a bad agent that’s all and it shows. Look at his brother, he signed for 4 years for 4 mil a year. Come one man. Seattle is where I lived for 14 years, and we have to play the mighty Seahawks (with Bennett) in Seattle this season! Obviously, we are gonna get killed! If they wanted him, they had ample opportunities to keep him. What they are saying now is nothing but Public relations spin doctoring. As usual . Apparently, They believe the fans here are stupid. Bennet is a so so defensive end, he played well against bad tackles and did nothing against good tackles. He only got a 1 yr deal, that should tell you something. The Bucs should look into getting Brad Jones from the Packers for the strong side LB spot. He is a good and I don’t think he is that expensive.